The Oscar Elders: 3 Octogenarians Make Academy Award History For James Ivory, Christopher Plummer and Agnes Varda, their late 80s are proving fruitful. They're now the three oldest people ever nominated for an Oscar. 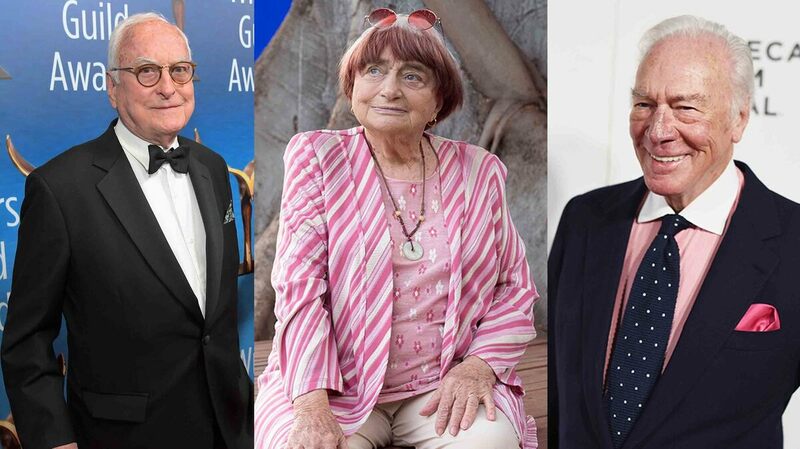 (L-R) James Ivory, Agnes Varda, and Christopher Plummer are all nominated for this year's Academy Awards. Let's call it #OscarsSoOld: Three of this year's Academy Award nominees are among the oldest ever. And we're not talking about honorary Oscars --these octogenarians are up for competitive Academy Awards for their recent work. At 88 years old, Christopher Plummer is the oldest nominee ever for best supporting actor — for the second time. At age 82, he was nominated (and won) for the movie Beginners. You can watch his adorably wry acceptance speech here. 89-year-old James Ivory, who directed and wrote many romantic films with his now-deceased partner Ismail Merchant, is up for best adapted screenplay with Call Me By Your Name. And 89-year-old Agnes Varda is only eight days older than Ivory, but that suffices to make her the oldest Oscar nominee in history. She's a film innovator who helped invent the French New Wave — her documentaries and feature films dissolve genres and are themselves works of art. So let's take a quick look at these incredibly prolific careers, starting with the actor who starred in one of the most successful movies in history: The Sound Of Music. Christopher Plummer has appeared in more than 200 films, including All The Money In The World, the one he was just nominated for. In 2011, Plummer told NPR that aging was an asset for a handsome man who hated being typecast as the lead. "Finally I was dissipated enough in my 40s to look like a character actor," he said. "And I enjoyed being a character actor because, of course, the roles were so much more interesting." As for Plummer's elders, Ivory is predicted to win in his category this year. If so, it'll be his very first Oscar, although he's been nominated three other times for directing the films A Room With A View, Howards End and The Remains Of The Day. Varda won an honorary Oscar in 2017. She started her own production company in 1977 that enabled her to write, direct, edit and do post-production work on most of her more than 50 films. "So she exercises incredible creative control," says Rebecca DeRoo, a professor at the Rochester Institute of Technology and author of Agnes Varda: Between Film, Photography And Art. The Belgian-born director was nominated for the documentary Faces Places, which she directed with a much younger collaborator, the artist JR. They discussed their movie on NPR in 2017. "We calculate that we are 55 years difference of age," Varda said. "And it doesn't show in the film. ... It shows in our faces." In the 2000 documentary Gleaners And I, Varda dives into the worlds of people who pick through fields and trash searching for useful or edible scraps. But it's also a profound personal meditation that touches on the director getting older, says DeRoo. "In one scene she goes to a field where potatoes have been dumped and they've grown in the shape of a heart," she says. "And she uses this as a kind of way to reflect on aging, as she keeps these heart-shaped potatoes in her home. And as they continue to age, they wrinkle, but they also sprout these new shoots and new life." It's a vibrant metaphor for the creativity of artists as they age. "You never stop learning how to act, both on-screen and on the stage," Christopher Plummer told NPR in 2012. "I feel like I'm starting all over again. Every sort of decade I feel this, and that's very satisfying." Plummer may break his own record as the oldest person to win an acting Oscar this year. And if he's joined by Agnes Varda and James Ivory, those three wins by three film legends would collectively represent almost two centuries of exemplary movie-making.